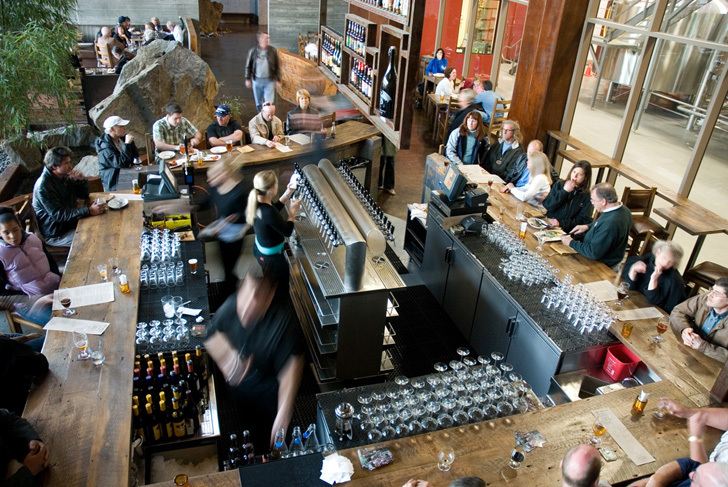 Twice named "All-Time Top Brewery on Planet Earth" by BeerAdvocate magazine, Stone Brewing Co. was founded in 1996 by Greg Koch and Steve Wagner and is the largest brewery in Southern California and the 10th largest craft brewery in the USA. 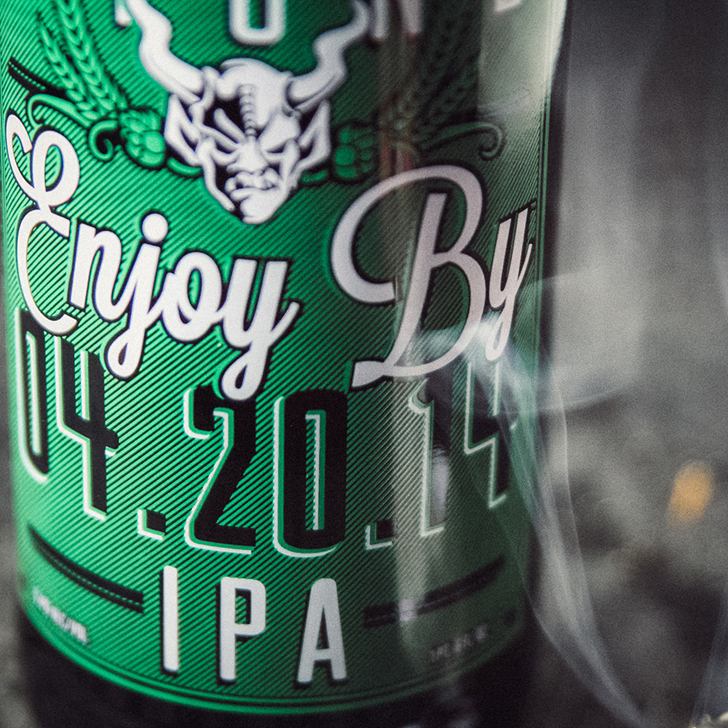 Most of their beers are characteristic of west-coast craft brews, meaning that they have a high hop content, and none represents this better than their Enjoy By double IPA. Hop aroma and flavour compounds are volatile and lose their punch over time. While aging some beers like Barleywines and Imperial Stouts can improve the beer, this is not the case for IPAs. 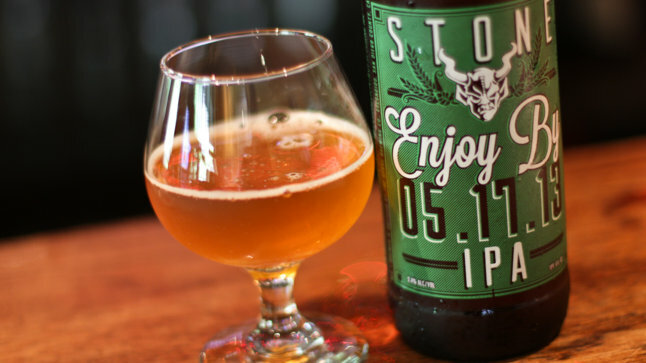 Because of this self-imposed short shelf life, Stone went a step further to make sure the label itself included the "Enjoy By" date right in the name so that it can't be missed. This date reflects a 35-day package-to-consumption cycle, meaning that to fully experience the beer's full potential it must be consumed within 35 days of bottling or kegging. The beer is bottled on day one, shipped on its own truck to Columbia [Stone's local distributor] on day 2 and by day 5 it needs to be in the accounts. Then 30 days later, on the day the label says the beer has expired, it is no longer fresh and must be pulled from all bars and retail spots if still around. Stone measures "buzz" for the beer through the company's website and social media (Facebook, Twitter, Instagram, etc.). Based on these interactions, Stone brings the beer to the locations that voice their interest the most. More information can be found here in the Stone blog. 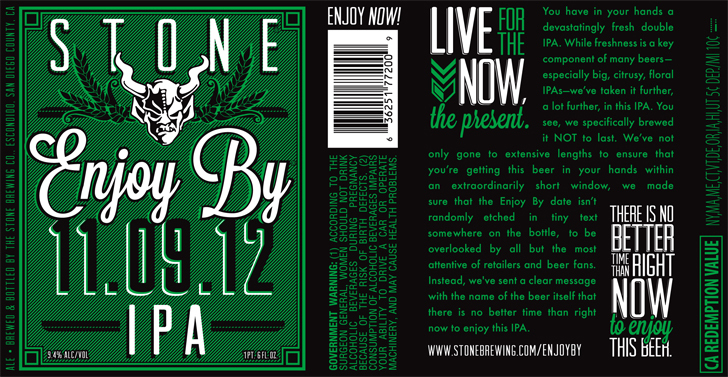 Complete details on each batch along with dates and locations is continuously updated on Stone's Enjoy By web page. Aroma: Intense dank hoppiness, resin, peaches and hints of tropical fruit are all evident in the aroma. Overall: We took the opportunity with this beer to use several interesting techniques we've learned during our many years of brewing great double IPAs. The result is an intense dry beer with very little malt sweetness, but with plenty of malt flavor to provide a background to the enormous...or shall I say "ginormous" hop character. Hopping, as might be expected, was over the top. First, the brew was mash-hopped with Calypso, a beautiful fruity hop that we also used in our Stone 16th Anniversary IPA, after which we kettle-hopped with a very small dose of Super Galena hop extract for bittering. Then, using a technique known in homebrew circles as "hop bursting," we loaded up very heavily on the flavor hops at the end of the boil and in the whirlpool. Simcoe, Delta, UK Target and Amarillo were used in the late kettle hop. New Zealand Motueka, Citra, and Cascade were used for the whirlpool hop. As you can clearly tell, this beer was super hoppy even before we dry-hopped it, but then we went for it...dry-hopping with one pound per barrel EACH of New Zealand Nelson Sauvin and Australian Galaxy. Drink extra-super-dank-and-tasty Stone Enjoy By IPA well before its 35-day shelf life to maximize the pungent glory that this beautiful, intense hop profile provides. As you can see, Stone is very forthcoming with the hop bill and they've confirmed that both the late kettle additions and dry hopping is done at a rate of a little over 1lb/bbl for each hop type. Mitch Steele has also been quoted as saying that the malt bill is just a mix of straight North American and English 2-row with some dextrose. For yeast choices, from what I understand Stone uses a proprietary strain that is similar to White Labs WLP007 Dry English Ale yeast. Given that the way they use it results in a fairly clean fermentation, any good clean American ale yeast would work as well including the Chico strain of yeasts (White Labs WLP001, Wyeast 1056, or Fermentis Safale US-05) which is my house strain. From what I've read, brewers that have tried brewing this beer with both WLP007 and WLP001 say the results are nearly indistinguishable. With this information, putting together a recipe is fairly straight forward. I first brewed this on April 1, 2014 (batch #171). Brew up a batch and let me know how you like it! * For recipes that call for simple sugars like corn sugar, adding them near the end of fermentation instead of in the boil can help if you have attenuation problems (ie: problems finishing near 1.010 for this beer). To do this, heat up some distilled water to near boiling (above 180F) and stir in about 1lb of corn sugar. Let it cool and add directly to the fermenter. Keep doing this every 2-3 days until all of the corn sugar is used up. Why does this help with attenuation? Yeast likes to eat simple sugars (like corn sugar) first before it attacks the more complex ones produced by the grain. By giving the yeast only the 'less tasty' stuff (complex sugars) first they're more likely to finish it all before moving on the 'tasty stuff' (simple sugars). Giving them both at the same time is like giving your kids dinner and desert at the same time. They'll eat desert first and then be too full to eat their dinner. Given them dinner first, and there's always room for desert. Mash at 147F for 90 mins then raise to 168F mashout and hold for 10 mins. Cool wort to 66F and aerate extremely well. Pure oxygen from a tank can help. Ferment at 66F for 7 days or until nearly complete. Add dry hop #2 and hold 5-7 days. Gently swirl 2-3 times/day. I brewed this a couple weeks ago and it's almost carb'd up. My youngest son likes the older Enjoy By better than the current 4/20/14 one and it appears that's the one your recipe is for. The current version is much more dank. Should be drinking this soon. How did your batch turn out? Mine turned out excellent! I find Mitch's tasting notes describes it well - lots of stone/tropical fruits, with some dankness (which I enjoy in an IPA). Kal are you whirlpooling your 0 minute hop additions at "flameout"? If so what temp and how long do you maintain the whirlpool? I'm not whirlpooling. Per the recipe, I put the "Lid on at flameout, start chilling immediately". Takes me about ~20 mins to chill through the CFC. I suppose you could consider this a ~20 min whirlpool for some of the wort. Result is an explosion of fruit with some dankness. Feel free to experiment however! Every setup is different. Process is often as important as the recipe and I can only say what I do on my setup. Your setup may be different and give different results. What do you think about creating a more 'sessionable' version of this recipe? I absolutely love EB IPA, but it's awfully heavy on the alcohol. I'd like to create a version with an OG of about 1.050 or less. Do you think if I just scaled the hops down it would come out okay? Sure! If you enjoy the hop flavour/aroma there's no reason why you can't do that. I've done this a few times with my recipes. I'm actually meaning to brew a 4.0 to 4.5 % ABV version of my Electric Pale Ale like this (it's normally around 6% ABV). For this beer, scale down the grain to hit 1.050 like you said, then scale back the hops but keep the mix the same and you'd have a nice Pale Ale I think. I'd probably go with 1/3 to 1/4 the amount of hops. So for this 12 gallon batch above, maybe 1 oz in the mash, 1 hop shot at 90 min, 0.5 oz for each of the 15 min hops, 1 oz for each of the 0 min, then 1 oz for each dry hop. Should come out to about ~40 IBU. I find you can't really go too heavy with late addition hops. If you brew something like this please let us know how it turns out! The next evolution in my brewing will come from optimizing my water profiles. I don't know what my starting profile is, but I know we're soft and alkaline. I have a crude ppm meter, which indicates my tap water is 36 ppm. I have an RO system that will get that down to 6 ppm. For all practical purposes, is that basically a clean slate from which I can assume the ions are zero? Second question- I've checked out EZ-Calc, and it's not as easy as I'd like. Is there a calculator that will allow me to input my starting profile, goal profile, and then it will out put how much of each additive I need in grams? With EZ-Calc it looks like you need to do a lot of fiddling with the additives to get the right amount of each ion. The next evolution in my brewing will come from optimizing my water profiles. I don't know what my starting profile is, but I know we're soft and alkaline. I have a crude ppm meter, which indicates my tap water is 36 ppm. If you're on city water your city should be able to provide you those numbers. If on well, Ward Labs has a test you can pay for for cheap to have your water tested. I have an RO system that will get that down to 6 ppm. For all practical purposes, is that basically a clean slate from which I can assume the ions are zero? No sure as I'm not sure what having "6 ppm" water really means. Does that mean combined solids (TDS) of only 6 ppm? If yes, then that's pretty close to RO. EZ's about the simplest thing I've found that gets it right. I remember playing with some others a long time ago but they often did some pretty messed up auto-calculating. I find the fiddling to be minimal once you've tried it once. My plan is to scale the recipe to 7 gallons, then scale the grain to a gravity to 1.050. Beersmith also scales the hops down proportionately. From what you wrote it sounds like I should multiply each hop addition by 0.25 or 0.333. Is that correct? I assume based on experience you believe that even with a proportionate scale down, the hops will simply be overwhelming at the lower gravity. When you say cut the hops to 1/3 or 1/4, do you mean scale the whole thing down, and then cut it to 1/3 or 1/4? (meaning cut the hops disproportionately lower) Or do you mean something else? So for this 12 gallon batch above, maybe 1 oz in the mash, 1 hop shot at 90 min, 0.5 oz for each of the 15 min hops, 1 oz for each of the 0 min, then 1 oz for each dry hop. Should come out to about ~40 IBU. I find you can't really go too heavy with late addition hops. YMMV. This was just a quick 2 min guess at what seems to make sense. Feel free to adjust based on what you like. Sort of. It's about trying to keep the BU:GU (bittering units to gravity units) about the same, though you can't go absolutely nuts with a Pale Ale. If you want you could probably keep the 0 and dry hop at 1/2 the original amounts if you really want a whackload of hop flavour. You could also completely drop the 90 min hop and only use the mash/15/0/dry ones and do about 1/2 the original amounts. That would be an interesting beer. I have another question about water profiles. Is the stated profile in the recipe the goal for the final batch, or the starting strike/sparge water? I would assume it's the goal for the final batch, adjusting for boil off. It's the Mash + Sparge water profile as done in EZWaterCalculator. I see what you're saying (never thought about salts getting more concentrated because of boil off), but there's nothing in EZWater about boil off rates nor in all my reading or forum discussions have I ever seen anyone adjusting salts for boil off. There's something I'm not correctly wrapping my head around at the moment... maybe the salts boil off as well so the ppm of each salt stays the same? Salts won't boil off and will become more concentrated by the end of the boil. The change in salt concentration is inversely proportional to the change in volume [volume goes down, salt concentration goes up and vice versa]. The ratio of salt concentration at the start of the boil (i.e. 110 ppm Ca) to the salt concentration at the end of the boil (x ppm Ca) will be INVERSELY proportional to the ratios of the pre-boil volume (14.9 gal) to the post boil volume (12 gal). Therefore, in the calculation below, PRE-boil salt concentration is on the top on the left side of the equation but POST-boil volume is on top on the right side of the equation. So I finished my 5.2% ABV version of EB a few days ago. Two weeks grain to glass. A few mistakes were made.... but in the end it came out good. Mistake #1) Overshot my initial mash temp, and I'm not sure how. I started with 164F strike water and after mixing with the grain it settled down in the high 150's. I probably should have allowed 10 minutes for the temp to equilibrate, but I reacted and added cool water to bring the temp down, undershooting of course. Then I spent the next 40 minutes trying to get the temp back to 149 and steady. I tried something new (bad idea..) and shut down the recirculation hoping just maintaining the grain bed at 150F would do the job. It may have, but the resulting wort was very light on sugar. My efficiency is usually 95% with this setup, but on this batch I was no better than 65%. So I had to supplement a few pounds of DME. i got the gravity back where I wanted, just in time for mistake #2. I fermented with US-05, and this was pretty much at FG within 5 days. At day 10, I mixed two ounces of the dry hops with 1 liter of boiling water, and let that infuse for 60 minutes while cooling. I added the entire contents of the french press to the brew, and let that sit for four more days. Next I kegged and carbonated. Pretty good under the circumstances! It's very heavy on tropical hop aromas when you stick your nose in the glass, so I'm very happy about that. The taste is very rich with dank grassy hops, but a bit light on the citrus. It's very dry (FG 1.009), I think I would enjoy it more just a tad sweeter. Perhaps a Witbread yeast would have compensated a bit. Yeast flavor is very neutral, as you would expect. There's a little astringent bitterness that I attribute to the water profile. Not enough to be annoying, but more than I usually want. At 5.2% ABV is is very drinkable, which is nice. I'll have to give this another go, perhaps when I upgrade my control panel and put a heating element in my HLT. Now, on to London Pride! It's mashing now. It's very dry (FG 1.009), I think I would enjoy it more just a tad sweeter. Perhaps a Witbread yeast would have compensated a bit. I probably should have mentioned this earlier, but one of the reasons we mash really high gravity beers at a low temp is to make sure the beer's not overly sweet once it's done fermenting. Yeast attenuates to a %, so the higher the starting gravity (SG), the higher the final gravity (FG). Conversely, if the SG is much lower as in your case, the FG will also be much lower. To end up at the same FG, lower gravity beers have to be mashed at higher temps or you need to use a higher % of grain that will not ferment out (like crystal), or both. Something like 152-154F would probably work well here with US-05 if making a 5% ABV version of this beer. Experimentation is required of course. Each time I've followed this recipe, I measured 1.061 - 1.062 (OG) and 1.010 - 1.011 (FG) I'm struggling to understand why I'm not hitting the OG that you indicated in the recipe. As I said, I'm pretty new...I am 99% sure that I have my water amount spot on (per the 1.25 lb/qt mash thickness)-- I've even had a buddy (who's been brewing for quite a few years double check my work). The 1.081 original gravity is based on 93% mash efficiency as listed in the recipe. If you're not getting 93% on your setup, you won't get the same OG and you need to compensate with more grain. Your brewing software let you know what your mash efficiency is based on what OG you get for a certain volume of grain. You have to brew at least once to know what your mash efficiency is. Things like sparge time have a big effect on it too. It has nothing to do with the water/grain ratio. That will slightly affect you FG as a more watery mash will be more fermentable. If you're looking to maximize your mash efficiency, I'd suggest starting reading the above links and then starting a new thread if you have questions. It [mash efficiency] has nothing to do with the water/grain ratio. That will slightly affect you FG as a more watery mash will be more fermentable. (braukraiser.com is offline at the moment, thus the Wayback Machine link). The results for mash thickness were somewhat surprising. Contrary to common believe [sic] no attenuation difference was seen between a thick mash (2.57 l/kg or 1.21 qt/lb) and a thin mash (5 l/kg or 2.37 qt/lb). Home brewing literature suggests that thin mashes lead to more fermentable worts, but technical brewing literature suggests that the mash concentration doesn't have much effect in well modified malts [Narziss, 2005]. Briggs cites data that doesn't show a change in fermentability when the mash thickness is changed [Briggs, 2004]. This was confirmed by these experiments where all the data points were on the same curve that had already been established in the temperature experiment. Note that the experiments for the 2.57 l/kg mash were run twice because the initial experiment resulted in a small mash volume that lost 5 degree Celsius over the duration of the mash. To keep the temperature drop between the experiments the same the mash volume was increased and the result was a 2 degree Celsius temperature drop which matched the temperature drop for the 5 l/kg mash. But in the end that didn't make a difference. Yup. Definitely not something I'd worry about. I've tried making the same lighter beer the same way but only changing the mash thickness and it didn't make any difference from what I can tell.